The reallocation process is essentially an abbreviated version of the allocation process described in the previous topic. There is no need for the client to go through the whole yoohoo, any servers out there want to give me a lease routine. Instead, the client attempts to find the server that gave it the lease in the first place, seeking a confirmation that the lease is still valid and that it may resume using its previously-allocated IP address. It also receives confirmation of the parameters it should use. The lease reallocation process consists of seven steps that correspond approximately to steps 8 through 14 of the full lease allocation process shown in Figure 263. In this example, the server that originally granted the lease to the client is Server #2, so it is normally the only one that responds. The IP address of its existing lease, in the Requested IP Address DHCP option. Note that this address is not put into the CIAddr field. Any additional configuration parameters it wants, in a Parameter Request List option in the message. The client broadcasts the DHCPREQUEST message. It then transitions to the REBOOTING state, where it waits for a reply from a server. Server Has Valid Client Lease Information: The server has information about the client's lease. It sends a DHCPACK message to confirm the lease. It will also reiterate any parameters the client should be using. Server Determines Client Lease Is Invalid: The server determines that the client's lease is no longer valid. Common reasons for this happening are the client trying to confirm a lease after it has moved to a different network, or after the least has in fact already expired. In such a case the server sends a DHCPNAK message to negate the lease request. Server Has No Definitive Information About Client Lease: A server that has no information about the lease does not respond. A server is also required not to respond unless its information is guaranteed to be accurate. So, for example, if a server has knowledge of an old expired lease, it cannot assume that the lease is no longer valid and send a DHCPNAK, unless it also has certain knowledge that no other server has a newer, valid lease for that client. 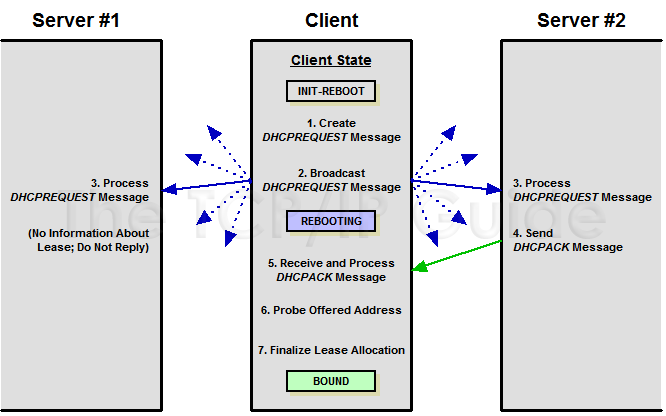 Servers that are going to respond to the clients DHCPREQUEST send their DHCPACK or DHCPNAK messages. Positive Acknowledgment: The client receives a DHCPACK message; this confirms the validity of the lease. The client will prepare to begin using the lease again, and continue with the next step below. Negative Acknowledgment: The message is a DHCPNAK, which tells the client that its lease is no longer valid. The client transitions back to the INIT state to get a new leasestep #1 in the allocation process. No Reply: If the client receives no reply at all, it may retransmit the DHCPREQUEST message. If no reply is received after a period of time, it will conclude that no server has information about its lease and will return to the INIT state to try to get a new lease. Before resuming use of its lease, the client device should perform a final check to ensure that the new address isn't already in use. Even though this should not be the case when a lease already exists, it's done anyway, as a safety measure of sorts. The check is the same as described in step #13 of the allocation process: an ARP request is issued on the local network, to see if any other device thinks it already has the IP address this client was just leased. If another device responds, the client sends a DHCPDECLINE message back to the server, which tells it that the lease is no good because some other device is using the address. The client then goes back to the INIT state to get a new lease. Assuming that the address is not already in use, the client finalizes the lease and transitions to the BOUND state. It is now ready for normal operation. Key Concept: If a client starts up and already has a lease, it need not go through the full lease allocation process; instead, it can use the shorter reallocation process. The client broadcasts a request to find the server that has the current information on its lease; that server responds back to confirm that the clients lease is still valid.